Feature | Sitting on the porch, rocking in his weathered chair, the old man slowly unfolded the yellowed newspaper in his lap. His grandson sat at his side taking interest in his every action. “Well Todd, this article is about something that happened to me and a couple of friends of mine a long long time ago.” Todd listened intently to his every word. His father had told him of his grandfather’s intense passion for old airplanes, old trains, boats and cars and especially motorcycles. Todd would visit his grandfather whenever school vacation came. He loved to go out to the old barn and hear him expound on his old Indian and that old Harley. He had kept them all, all the fine machines that he had restored long ago. Now Todd would soon enjoy them too. His grandfather had hoped that that his father Robert would would take them and ride them some day, but he became interested in other hobbies and his vocation left no time for such endeavors. The old man still had hope he could pass them on to someone just as interested as he had once been. Todd might soon fill the bill. As the old man rocked in his chair he began to read the old newspaper article to his grandson. Back came a flood of memories long forgotten. Todd couldn’t believe what he was hearing. His grandfather, one Earnest T. Smith, had been a true rebel in his day. A hero in a movement to set free things that he held near and dear. As the old man finished the article a gleam came to his eye and he turned to see the surprised look on Todd’s face. “Maybe I’d better tell you the whole story from the beginning. Maybe then you will understand why we did what we felt we had to do. “A long time ago, around 1993, or maybe it was ’94, my old friends Bill James and Frank Harder and I were sitting around the barn out back. We were just getting ready for a weekend road run put on by our local antique motorcycles club. I had just read an article in one of our favorite old motorcycle magazines about how investors and speculators were taking our hobby, or sport if you will, and were driving up the prices. It also stated that they viewed their old machines as art objects and never intended their wheels to roll on any roads again. One man had over a hundred machines sealed in plastic boxes to keep them from ever seeing the light of day again. It seemed unreal that such a thing could happen. “We knew that everything on planet Earth was in a state of galvanic corrosion. From the minute you finished restoring a machine, no matter how perfect it was, it would start to deteriorate bit by bit. They would all need refurbishing down the road. Everything changes; nothing can stay as it is forever. Besides, these were vehicles designed and built to travel, to ride the roads and take their riders from place to place. “It was then and there that we made our pact. We formed, the three of us, a secret club. We decided to try to liberate, if only for a short time, some of these machines. To see their tires worn and scuffed. To see their motors oil-soaked and gas-stained. To hear their exhaust pipes roar with sounds long forgotten. Yes, it would be against the law to take another man’s moto in the dead of night and set it free, if only for an hour or two; to blemish his perfect investment, even if it was one he himself would never allow its valves to move to its tires to roll. But we had to chance it. We could not let them all come to this dreary end. “Bill, Frank and I started riding and restoring old motorcycles when we were just young men back from the war, you know, the ''Nam' one. We all grew up together and went to the same school. Our dads had always been interested in all types of old vehicles and passed that love on to us. “We enjoyed many days through the following years riding through the countryside on our Indians, Harleys, Excelsiors, Popes, etc. We couldn’t believe that some people owned these same machines and would never let them be seen, or even if they took them out to be viewed, to never let them be heard or seen in motion. “We had to act and we did. We would load up my trusty old ’37 Chevy pickup with oil, gas and an air tank and head to a location we would have scouted out beforehand. We would break in, for lack of a better word, and roll the imprisoned motor down the road to my truck. There we would fill it with oil and gas, air up the tires and bring it to life. Sometimes this took some doing. Because many of these motors had never been run, their timing and carburetors were way out of adjustment. Many times we would have to give them a full tuneup before riding them. We would trade off and ride them around for about an hour or two until we felt they were truly run in and able to be called road worthy once more. “We would place them where we had found them and make the trip back home. This went on for a couple years.We would liberate a couple of machines a month and no one was the wiser. Then it happened. We knew the police were actively pursuing us but we never left a clue. We wore black stocking masks, black pants and long-sleeve T-shirts and gloves. We were always careful and never harmed or misused any of the machines we rode, but we knew we would not always be so lucky. “The owners of these previously unused machines didn’t find it funny one bit. They started losing points at concourse events for blued exhaust systems, for gas and oil stains and blemishes on their tires. They were angry and soon posted rewards for our capture and imprisonment. We knew it wouldn’t be long now but we just could not stop. There were so many machines that were still unridden, still imprisoned, still unheard. One night on one of our missions Frank was out riding the motor. When he came back we knew the end was near. He had been riding the beautifully restored 401 Indian four when a large truck came on him from nowhere and forced him off the road. Frank and the machine were all right except for the torn edge of its fine leather saddle. We knew we had to repair or replace it before we put it back in the owner’s garage. Bill acted first. He told us to hang on and he would be back in an hour or so with a replacement. We had no choice but to wait. Off he roared shooting dirt and gravel everywhere. True to his word he came back with the saddle off of his beloved Ace. We quickly switched seats, replaced the Indian and retreated to my barn many miles away. “Bill sent what was now his saddle to a man who had been recovering all our saddles for many years. We expected it back in just a week or two. What we didn’t know was that the owner of the 401 Indian had discovered our deception and had contacted our saddle man about any work he might have done on a similar saddle. I guess it didn’t take John Law too long to put two and two together because a few days later the three of us were arrested and booked for various breaking and entering and theft laws. “To make a long story short, Todd, we were soon before the judge for sentencing. We had all pleaded guilty with an explanation. The judge, an old grey-haired gentleman, listened intently to our tale of why we felt we had to do what we had been doing. He leaned back in his chair high above us, and I will never forget the words he spoke to us. He sentenced us to a year of public service educating the public about this country’s fabulous two-wheeled transportation history. We had to promise never to liberate another antique motorcycle as long as we lived. “We quickly agreed and were set free. That’s when I saw the reporter in the back of the courtroom jotting down notes for the article I just read you. A year later our community service was done but we never truly finished. We always took time to pass on the history of our old motors whenever we were given the chance. “A couple of years later I ran into the same judge who had been so lenient with us and I asked him why. He simply smiled and said that his father had ridden a 'four' when he had been a young man and had passed it on to him. He was too old to ride it now but it still hung proudly in the rafters of his garage next to his beloved ’55 Chevy coupe which he still drove every day since he bought it new. Todd coaxed his grandfather out of his rocking chair and down the path to the barn out back of the house. Once there he threw back the tarp covering one of his grandfather’s prized machines, a 1928 101 Indian Scout. The old man could tell by the excitement in Todd’s voice what he wanted to do. After topping it off with gas and oil it fired on the first kick. With very little explanation Todd roared off down the narrow road leading up to his grandfather's house. If Todd had not been so busy at the controls he would have seen the tears of joy streaming down the old man’s face. The old man knew then and there that he had found someone to pass his beloved machines to. Todd had the same passion that had consumed him for over 60 years and he knew it would never die. All show and no go makes your machines dead! 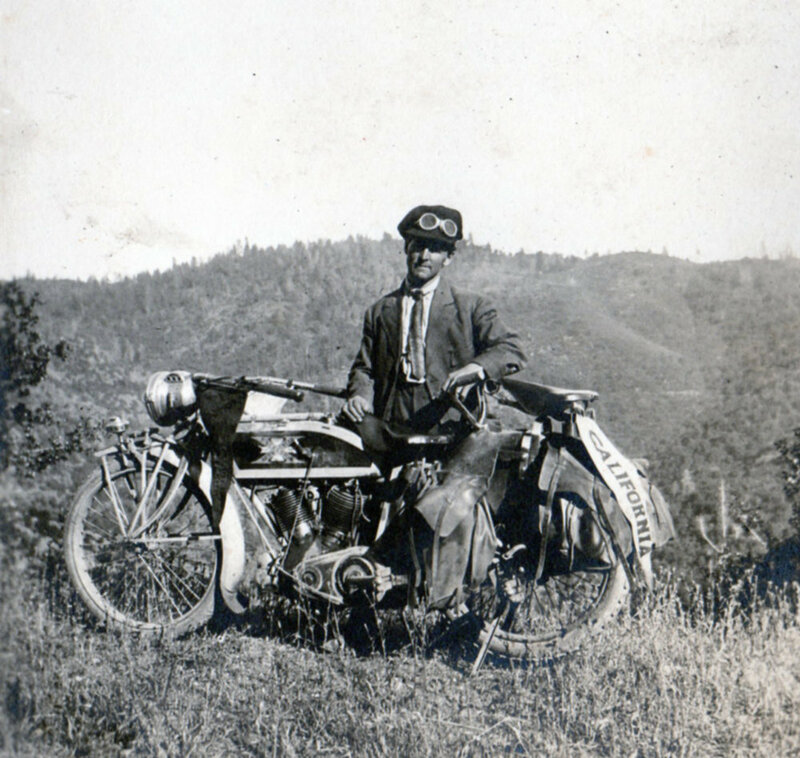 Richard Ostrander is the long time historian of the Fort Sutter Chapter of the Antique Motorcycle Club of America. He has written a number of articles for RUST as well as many national vintage motorcycle publications. When he is not researching the history of those who came before us he spends his time working on and riding antique motorcycles. Check out his article on Joe Petrali in the Archives section of RUST.